The evolution of Nitekrawla began over 15 years ago. Born and raised in Boston Massachusetts in the late 70’s Anthony Errico A.K.A. Nitekrawla began dj-ing in his teen years after being exposed to electronic music by an old friend of the day. Growing up during the 80’s the electronic synth based sounds of 80’s pop music had already been consuming his young mind from an early age and once he was exposed electronic music he knew that is was something he could connect with on a different level. Waisting no time getting his hands dirty and it wasn’t long before he found himself in the local record shops like Boston Beat and Satellite refining his sound and buying up ep’s left and right, even though he only had one turntable to play them on. Years later what had started as a hobby developed into a full blown addiction to 4X4 beats and electronic sounds, it was at this point he decided to acquire a second deck and a mixer. 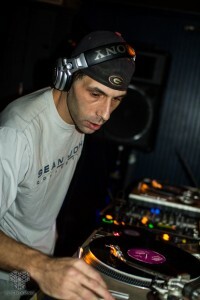 During the years to come Nitekrawla began refining his sound and mixing techniques in order to establish himself as an original artist dedicated to playing specific grooves of intelligence. It was right around the turn of the millennium though he found himself pushing to play for the masses. Facing an overcrowded local scene with far more artists than venues and an even more diverse crowd planting himself amongst the local underground music scene would be no easy task. An underground artist in a mostly commercialized scene getting opportunities to play venues was far and few between. Forced to retreat to the underground in the early part of 2004 one night he found himself spinning an all night underground party along side of some of the areas local dj’s and it was at this moment in time in which he boasted some solid connections that would eventually lead him from the underground to the surface to play such venues as Wonder Bar and An Tains and eventually stepping up to venues like Splash, Machine, Rise After-Hours and National Underground NYC. With his first release on Sonik Boom in early 2011 Nitekrawla’s productions are a reflection of his time in the dj booth implementing what years of dj-ing has taught him in the studio and dedicating just as much energy to perfecting his productions as he does perfecting his mixes. Now into his early thirties and dj-ing for more than half his life Nitekrawla is fully committed to providing earth shattering beats while staying true to his underground roots. To bring a more conscious awareness to the importance of underground music in the music scene and If i cant build it or fix it then we as a collective dont need it.